Thousands of foreign-trained immigrant physicians are living in the United States with lifesaving skills that are going unused because they stumbled over one of the many hurdles in the path toward becoming a licensed doctor here. The involved testing process and often duplicative training these doctors must go through are intended to make sure they meet this country’s high quality standards, which American medical industry groups say are unmatched elsewhere in the world. 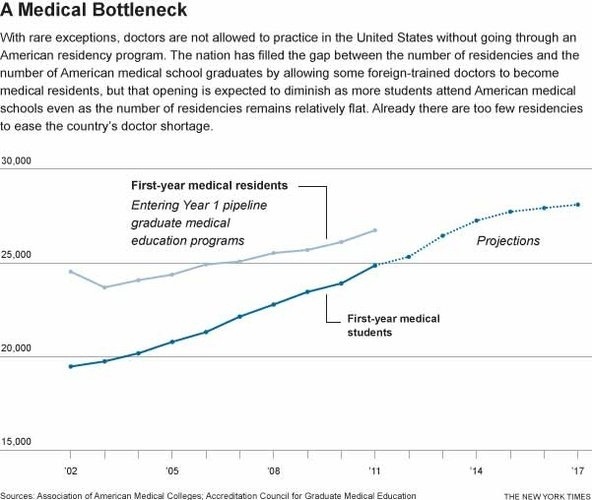 Some development experts are also loath to make it too easy for foreign doctors to practice here because of the risk of a “brain drain” abroad. But many foreign physicians and their advocates argue that the process is unnecessarily restrictive and time-consuming, particularly since America’s need for doctors will expand sharply in a few short months under President Obama’s health care law. They point out that medical services cost far more in the United States than elsewhere in the world, in part because of such restrictions. The United States already faces a shortage of physicians in many parts of the country, especially in specialties where foreign-trained physicians are most likely to practice, like primary care.